Chronic Obstructive Pulmonary Disease or COPD is a general term that encompasses two conditions, namely chronic bronchitis and emphysema. Both cause obstruction of the airways, though in different ways, and reduce oxygen and carbon dioxide exchange efficiency. 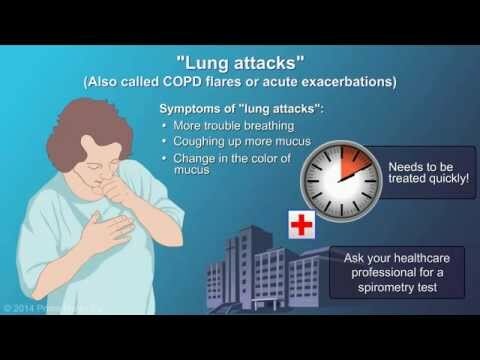 Consequently, COPD diagnosis requires detailed tests in order to differentiate the two diseases. However, a set of generic tests that measure airflow, blood oxygen levels, and other factors are still used in an initial COPD diagnosis. Spirometry is the first of those tests, which involves measuring lung capacity. It is a simple, non-invasive, airtime measurement test performed in a doctor's office. The patient inhales deeply then breathes out into a tube and the amount of air exhaled measured. When the results are about seventy percent of the volume exhaled by a healthy person, COPD of some type is almost certain. The test is often run multiple times, and a variation called post-bronchodilator spirometry will sometimes be performed. In this test, the patient is given a bronchodilator to relax and expand the airways. The doctor then performs the standard spirometry test and observes the results. Apart from helping to confirm the chronic obstructive pulmonary disease diagnosis, this variation indicates whether the reduction in lung capacity is reversible. As well as spirometry, the lung volume can be indirectly measured with either gas dilution or body plethysmography. In gas dilution, the patient inhales nitrogen or helium instead of air. The volume distribution of the gas is measured as a substitute for lung volume. Body plethysmography is carried out with the patient in an airtight chamber. He or she then inhales and exhales through a tube and a machine records pressure changes in the plethysmograph to calculate the volume of air the lungs can hold. The results of the tests are adjusted for height, age, and other individual factors to compare against averages across the population. Because the main function of the alveoli, which are the tiny sacs at the end of the bronchioles or airways, is to enable gas exchange of oxygen and carbon dioxide, a measure of their diffusion capacity is diagnostic. In this test, the patient inhales a small amount of carbon monoxide. In large amounts it is toxic, but at the levels of the test it is perfectly safe. Extracting a blood sample and measuring the carbon monoxide content determine the amount taken up into the blood. This is one of the methods used to detect emphysema. Likewise, the quantity of dissolved oxygen in the blood provides useful information for chronic obstructive pulmonary disease diagnosis. There are several ways to go about it. One test takes a sample of arterial blood and measures the oxygen content. However, the test is somewhat painful since extracting blood from an artery is more uncomfortable than the usual vein method. Consequently, an alternative called oximetry is sometimes used. Once these tests are completed, your physician will have considerable information on which to base a chronic obstructive pulmonary disease diagnosis and if COPD is strongly suspected, he or she may recommend follow up tests and begin to form a recommended course of treatment.